Sheep Porcupine Island is likely one of the most photographed islands in Acadia National Park other than Mount Desert Island. Yet, most people are not even aware of its name. The reason why it is so often photographed is because of its close proximity to Bar Harbor, Maine and how this often places it squarely in the background of most any photo taken from the public pier, Agamont Park, or the Shore Path, especially during most every sunrise. The position of the sun changes relative to the time of year and where you are between the pier and the Shore Path, Try a few different places for that “perfect” composition. It may be difficult to locate information about this small little island online. 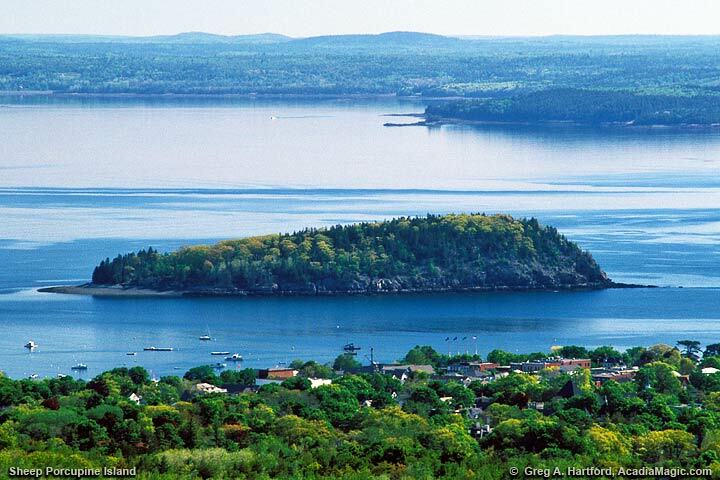 First, one might assume that it is located within Bar Harbor since it is a short distance offshore. But this is not the case. It is actually in Gouldsboro, a town located on the mainland near Schoodic Peninsula! As the crow flies, the Gouldsboro town office is about 8.5 miles to the northeast of the Bar Harbor pier. But, via the highway, this translates to about a 40 minute drive. (See Gouldsboro History.) A good reason to visit that area is to see the Schoodic portion of Acadia National Park - the only section of the Park located on the mainland. Have you noticed the odd shape of the islands in this part of Maine? There is a gradual incline on the north side with a much steeper drop on the southern downside. The reason for this is simple. Thousands of years ago, huge glaciers, as much as two miles high in sections, slowly migrated across the land in a southeasterly direction. The weight of this ice sheet was so enormous that it sheared off parts of the islands as it moved over them. The glacier also scooped out large sections of land that became ponds, lakes, and even fjards like Somes Sound. If you look at the map of Mount Desert Island, you will see how the lakes and other bodies of water follow this north to southeastern direction. Sheep Porcupine Island is a nesting area for the American Eagle and a variety of seabirds. Consequently, the island is closed to public access during nesting season which is February 15 through August 31 of each year. The only access is by boat. If you plan on kayaking or boating near the island, be sure to take along some binoculars for getting a closer view of the birds. Also, be sure to have a Coast Guard approved life vest for each passenger while boating on Maine waters. If you need to find a kayak rental business or would like to participate in an organized or custom tour, visit the Kayak Rentals page. 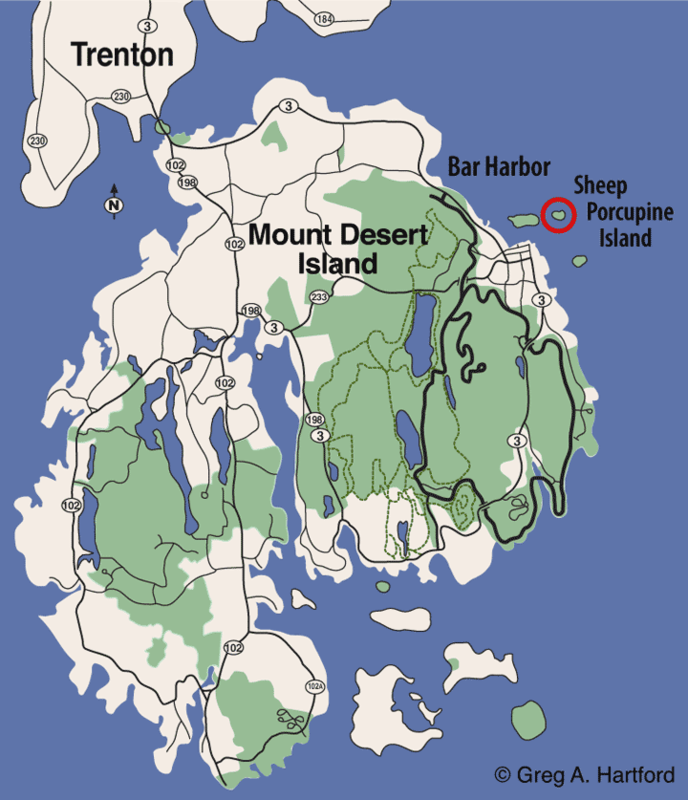 Sheep Porcupine Island sits right in the middle of the easterly harbor view from the Bar Harbor Public Pier and much of the Shore Path. A variety of boats, as well as large cruise ships may very well be near it given most any morning, day, or evening during normal season months. Some lucky souls may be skimming around the island’s perimeter in kayaks or canoes. When the harbor display’s its calm and peaceful side, there is nothing quite like it. If taking photographs early in the morning, be sure to try from the pier, and from different points along the Shore Path to get some of the best shots.